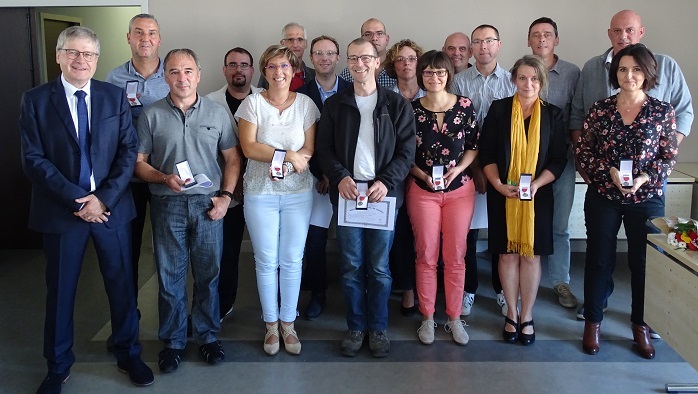 Friday, September 28, a hundred employees from Fives Cinetic, from the Automation activity, specialized in the design and supply of complete and integrated automated systems, were gathered at Pierre Carmien Center in Héricourt for the traditional ceremony of the awards. For this year 2018, they were 18 to be decorated by Thierry Malard, the Executive Director of the company. Thierry Malard spoke about their personality and career path, rich and varied for most of them. The majority of the company's different know-how was represented, from the workshop to the purchasing department, through the engineering offices and the support departments. For some, the awarding was for a long career, while for others it was a first time in their professional life, but for all it was an opportunity to value the efforts and years of work.